Breath Work: Includes Alternate Nostril Breathing, Breath of Fire and More. Stress and breath go hand in hand. One minute, you're thinking something wonderful and you hear yourself sigh...not realizing that you were holding your breath for quite some time. Or, as you start to try something new or something nerve-wracking, you notice you take a breath and hold it. Your nose is exceptionally clever. Simply by practicing a few rounds of alternate nostril breathing (pranayama) for a few minutes each day, you can help restore any imbalances in your brain. You can improve sleep, encourage a calmer emotional state, boost your thinking power and soothe your nervous system. How impressive is that! When the energy is not balanced, one of the most visible ways in which this is seen, is in the nostrils. Most of the time, one or the other nostril is more dominant, allowing air to move more freely. This is quite a natural process. However, when they are flowing evenly, the mind really likes to be quiet and meditate. Alternate Nostril breathing is a method where you consciously work with that energy by regulating the physical breath in one or the other nostril. This in turn effects the energy and mind. It brings balance, and allows the energy to flow in the center, rather than on the left or right side. To control the flow of breath, one usually begins by using their fingers to block off one nostril so as to allow the other to flow. Then, the fingers are moved so as to block the opposite nostril, and allow the previously blocked nostril to flow. This cycle will be repeated several times. One method of alternate nostril breathing that is easy to understand (when written down like this) is to exhale and inhale from one nostril five times. Then, do five times with the other nostril. That is called a "round." Doing three rounds is a complete practice. There are a variety of different patterns of doing alternate nostril breathing (such as the five on each side method). This physical act really does have an effect on the autonomic nervous system, and allows one to become "centered" in such a way that both nostrils are flowing smoothly. In this state, the mind is also quite relaxed. Gradually, one learns to do this with attention, not the fingers, allowing attention to move from one to the other nostril. One sits quietly, with eyes closed, and simply places attention on the nostril. 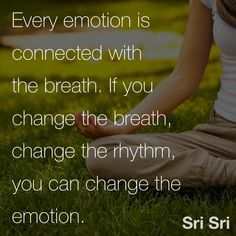 With each breath expand a bit faster and contract a bit faster until without expanding or contracting completely, a rhythm is felt, and you let that rhythm take over (will mimic the sound of an old-fashioned train pushing faster and faster). Don't be worried about how deep you inhale or exhale...just make sure the ABDOMEN is expanding, not your lungs/ribcage. And here is a FABULOUS in-depth article of Breath of Fire work.